Behringer Xenyx Q802USB USB Audio Mixer, Taalmusicals.vijayawada. A total of two proprietary Xenyx mic preamps feature 130 dB of dynamic range with a bandwidth that extends from below 10 Hz to 200 kHz. Both mono channels feature a built-in, one-knob compressor for quick dynamics control in live sound and recording situations. There are 3-band EQs on all mono channels. In addition to all this, the Xenyx Q802USB features a 2-input / 2-output USB audio interface for direct recording to software. Audacity recording software, as well as 150 instrument and effects plug-ins are available for free download. 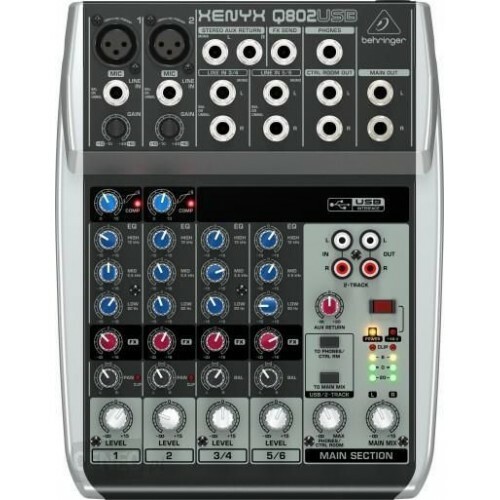 The Behringer Xenyx Q802USB includes a power supply and a USB cable.